That is the calculation made using OptimumLap simulation software by OptimumG a vehicle dynamics consulting and data acquisition company based in Colorado and boasting a client list that reads like a who's who of international racing and automobile manufacturing. 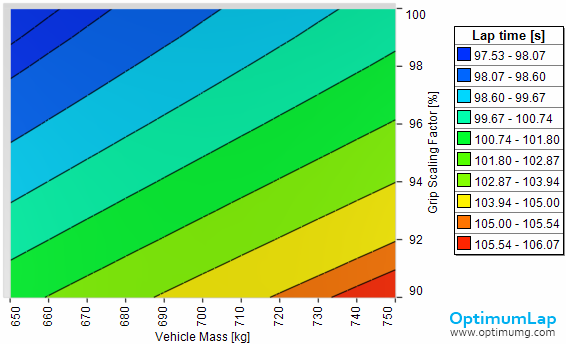 Henning Olsson, one of OptimumG's lead simulation engineers, wrote a detailed article examining key factors essential for formulating a plan to optimize lap times: aerodynamics, gearing, traction, braking and fuel consumption. Olsson admits their simulation is not as sophisticated as what Formula 1 teams have been running because obviously teams guard their specific aero maps, tire models and suspension kinematics like state secrets but, none the less, key factors for the race can be identified. 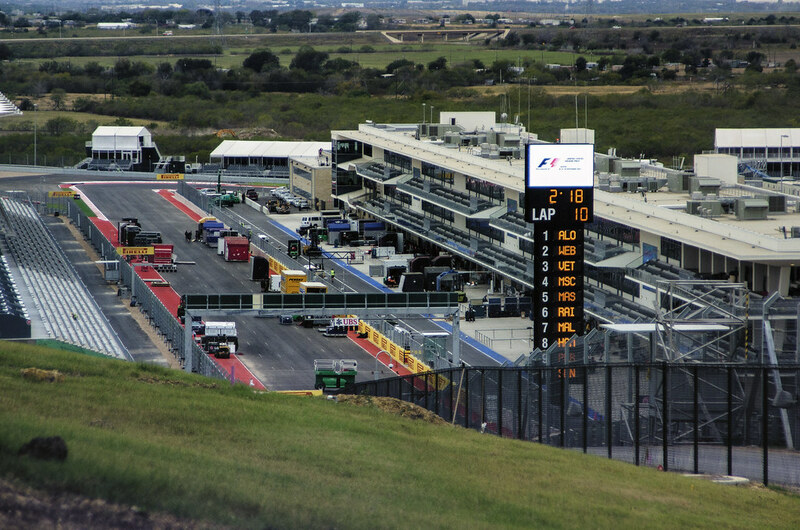 One of the fascinating things about this, the first ever race at the Circuit of the Americas will be that nobody has been there so, at least in theory, from a simulation standpoint every team is starting from the same point. OptimumG's simulations indicate that the track in Austin offers a fairly large possible variation in setup tradeoffs between downforce and top speed, to produce similar lap times and that is good news for racing. The prediction is for a top speed sweet spot anywhere between 315 and 307km/h. Of course opting for more downforce will be great if you're in front, not so good if you have to pass. In the simulation tables you can spot an issue for Ferrari and Alonso, a +5% increase in aero efficiency is computed as -1.15 improvement in lap time. Is the RB8 5% more efficient than the Ferrari? Probably not but there is no doubt that cheater brilliant bendy nose is doing something and Alonso's week end, barring some miracle new aero bit, will be as uphill as the run up to turn 1. Among the unknowns at COTA are tire wear and grip. One of the biggest challenges for teams will be figuring out when to stop for tires, taking into consideration fuel load and changing track conditions. As Olsson explains, teams will be keen to determine during practice things like, how many laps does it take for the tires to lose 1% of their grip and what the fuel load sensitivity will be. This is a window into the depth of racing but before you conclude it's all about the Neweys and their slide rules, megaminds and supercomputers Claude Rouelle, OptimumG's founder, identifies the edge, the one singular and paramount factor in performance above all others: the human factor. Rouelle is, among other things, a judge for Formula SAE competition and if you have a half hour of time I would urge you to watch the video below. His advice is to students but the concepts apply and will help you understand so much about Formula 1 and, indeed any form of racing. Thank you very much to Florian Wehner, a Formula SAE student from Germany who sent a link to the article! Claude Rouelle: Advice for SAE Teams from Adam Miszta on Vimeo. o0o0o0 1:36.49 i fp3 from vettel. Thats a full second up from this prediction. Amazing... 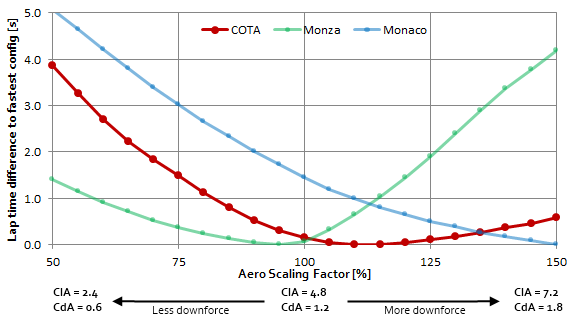 If you dig into the article they have that variance table with the downforce and gearing changes. On the onboard it looked like the RB8 has loads of downforce in those medium speed corners. 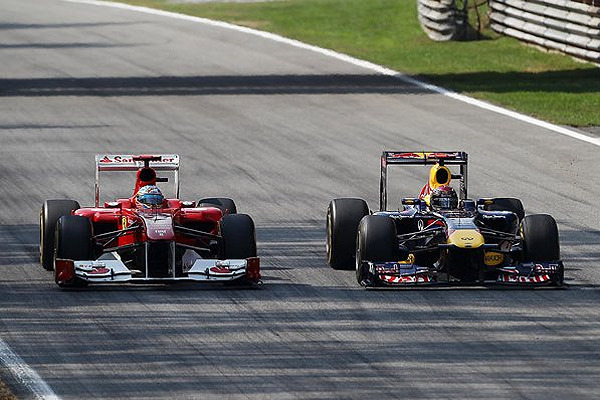 Compare the Vettel and Alonso in those final turns....poor Fernando! Yeah both he and Massa were really struggling in the tighter corners. It's going to be a very exciting quali/race, I hope the macs bring their A-game. That reliability issue better not reappear, either. Given the varying grip levels between the cars I hope to see a lot of passing give/take. Maybe it'll be what the US needs to see to get F1 back into the limelight. Given that they went directly to snooze-fest NASCAR qualifying after P3 I hope ppl pay attention. Single-car on track quali, I mean, *YAAAAWN*. No wonder the stock car fans drink so much. Something to ease the painfully boring lameness.